I know what you’re thinking. Another arepa recipe? Yes, and without a doubt there will be more to come since we eat lots and lots of arepas in Colombia. I can’t remember where I learned this but a while back I heard someone say that there are at least 50 different types of arepas made in Colombia. I believe this is the fifth arepa recipe I have posted, 45 more to go! 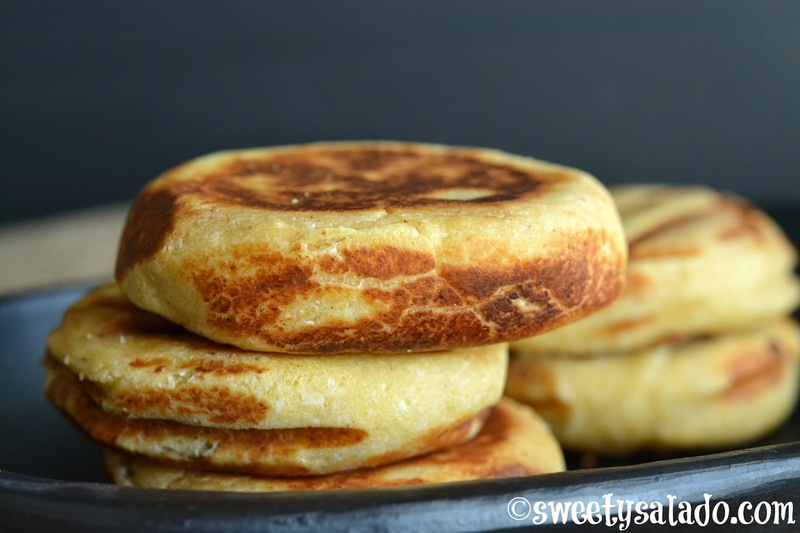 Besides the arepa de huevo, these arepas boyacenses are one of my favorites because the all purpose flour gives them an unbelievable texture. They are made with cuajada, which is a very creamy, soft cheese, but since I can’t find it here in the US, I just use Mexican queso fresco and they still come out delicious. 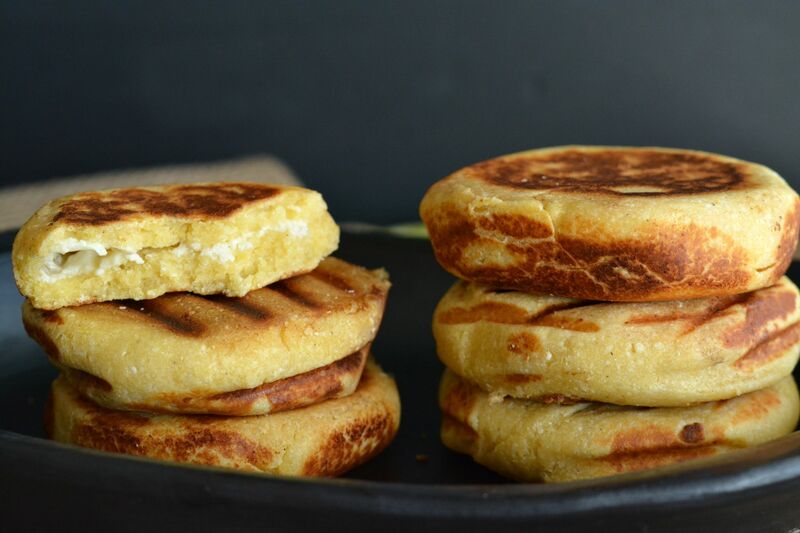 And here are the other arepa recipes I have here on the blog so far: Colombian arepas, arepa de huevo (egg stuffed arepa), arepas santandereanas (made with pork belly and cassava) and sweet corn arepas. Of course, that list will keep growing, so I hope you stay tuned until I post the next one! In a large bowl mix the yellow pre-cooked cornmeal, all purpose flour, sugar and salt. Add the 1½ cup (150 g) cuajada or queso fresco, melted butter and whole milk. Stir and knead well with your hands until you get a soft and smooth dough. If you notice that the dough is a bit dry you can add a little more milk. Divide the dough into 7-8 portions of about 2-3 inches (5-7.5 cm) in diameter. Shape each portion into a ball, then push the center with your thumbs to shape it into a small cup. Fill it with about 1-2 tbsp of cuajada or queso fresco, then close the edges in the center to seal it shut and shape it into a ball once again. Gently press the ball into a small arepa of about ½ inch (1.27 cm) thick. Melt about 2 tbsp of butter in a large non-stick pan over medium heat and grill the arepas for 4-5 minutes per side or until they're golden brown. Make sure to also grill the sides until they're golden brown. Serve immediately. Hello. Thank you for the awesome recipe. Would I be able to cook these in the oven, instead of pan frying them ?. 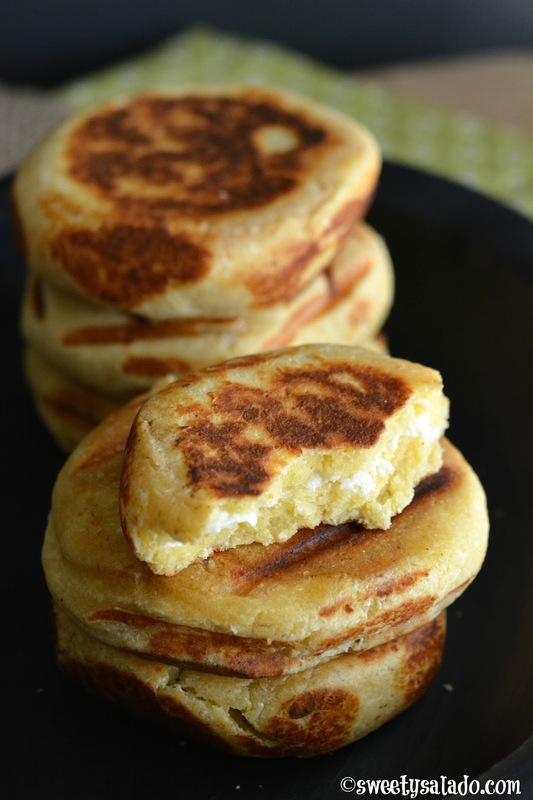 Hi Jorge, arepas are always grilled so they can turn golden brown but since these are also made with all purpose flour, they might come out OK if you bake them instead. I have never made them that way but it might work for you.